This is my first of 3 posts for The Medicine in the Movies Blogathon being hosted by Charlene of Charlene’s (Mostly) Classic Movie Reviews. Brief Synopsis – A doctor in a psychiatric ward in the late 1960’s tries to find a way to help comatose patients. Based on a true story. 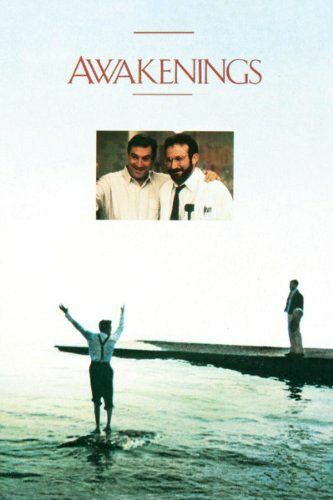 My Take on it – This is a film that I recall seeing in the theaters when it came out and was both impressed then and now at the amazing performances by Robin Williams and Robert DeNiro. As much as I’ve always loved Williams in comedic roles, he was such a powerful actor in his serious roles to and this is a prime example of that. DeNiro was able to show us both the mental and physical ailments of his character in quite a believable way that we truly think he is also suffering from the disease. It is so understandable to me how both men were able to get award nominations for these roles; Williams at the Golden Globes and DeNiro at the Oscars, but neither could win the awards that year. The story itself is quite heartwarming and works most of the time yet it does falter a bit here and there around the midway point and doesn’t fully manage to recover. Despite the great performances by the two leading men, their characters lack a much needed chemistry that makes them feel more distant than they probably should be. Bottom Line – Williams and DeNiro are both excellent here and it’s understandable how they both could get acting nominations for these roles; Williams at the Globes and DeNiro at the Oscars. The story is heartwarming yet falls a bit flat about half way through. The biggest problem that I had with this is that despite both lead actors giving amazing performances, they lack a chemistry that a film like this sorely needed. Recommended! I love this film so much. Robin Williams really excelled in dramatic roles, and Robert De Niro gave another memorable, believable performance. I never really thought about the lack of chemistry between them before. Now that I think about it with respect to this film, I feel like it was necessary to keep some distance between De Niro and Williams’ characters to more accurately convey the boundaries between health care providers and patients. However, I definitely see your point. Thanks so much for your contribution to the blogathon!